Because it is 22 freaking degrees and we are giddy, above is a photo of no actual news value, but much happiness value. 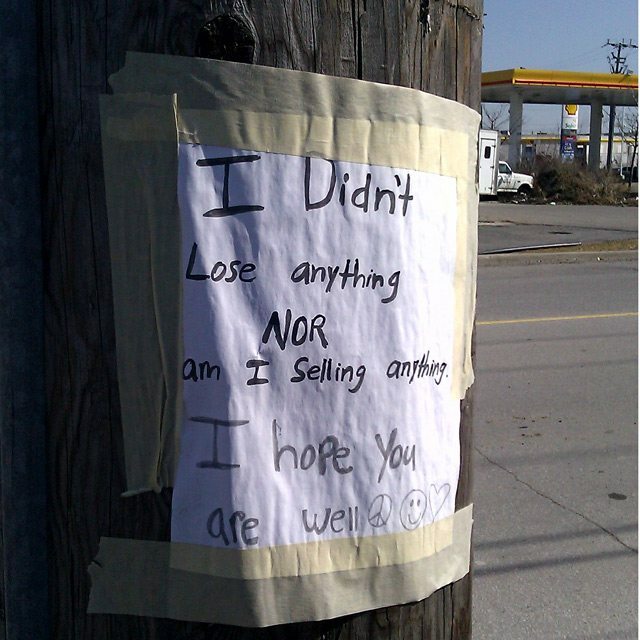 The sign was spotted at Dufferin and Wilson last week. Thank you, happy sign maker. Things aren’t looking all that hopeful for Rob Ford when it comes to this Wednesday’s transit debate about whether to build light rail or a subway on Sheppard. Councillor Jaye Robinson (Ward 25, Don Valley West), who sits on Ford’s carefully selected Executive Committee and votes with him most of the time, is seeking her constituents’ input on that vote. If she hasn’t made up her mind yet to back Ford, that bodes ill for his underground aspirations. Did you know you could get paid for drinking beer? If you have a very good set of taste buds and complete a rigorous training program, it turns out that you can. This weekend, the Globe learned more from Canada’s eighth, and only female, beer sommelier, Mirella Amato. Fond memories of the High Park castle playground, from one of the kids who helped design it back in the late ’90s. A plan to rebuild the playground, which fell victim to a suspicious fire this weekend, is already under development.